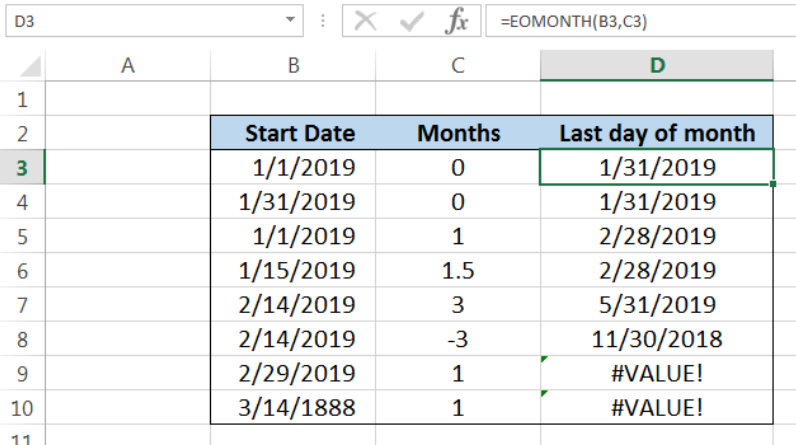 While working with Excel, we are able to determine the last day of the month of any future or past date by using the EOMONTH function. This function is especially useful when determining maturity or due dates. This tutorial will assist all levels of Excel users in getting the last day of the month for any specified date. Our table contains three columns: Start Date (column B), Months (column C) and Last day of month (column D). 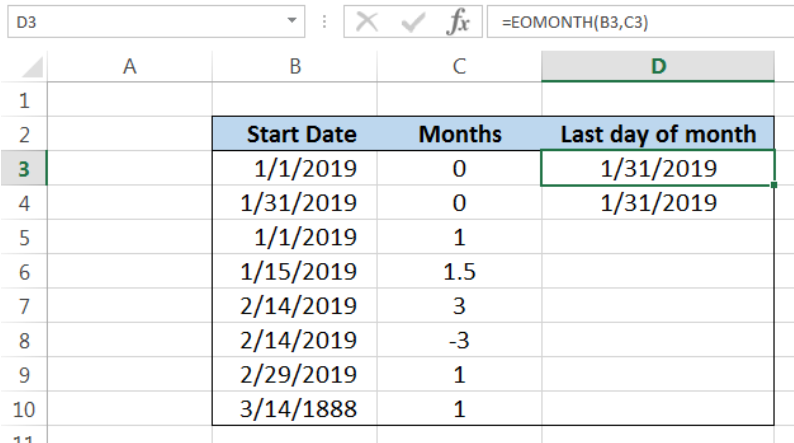 We want to add or subtract the number of months in column C from the start date in column B and return the last day of the month of the resulting date. The results will be recorded in column D.
For our first example in row 3, the number of months is zero “0”. Hence, the EOMONTH function returns the same month as the start date, but falling on the last day. As a result, the value in D3 is “1/31/2019”. In row 4, the start date is 1/31/2019, which is already the last day of January. Setting the number of months to zero “0” yields the same result as the start date. The result in cell D4 is also “1/31/2019”. 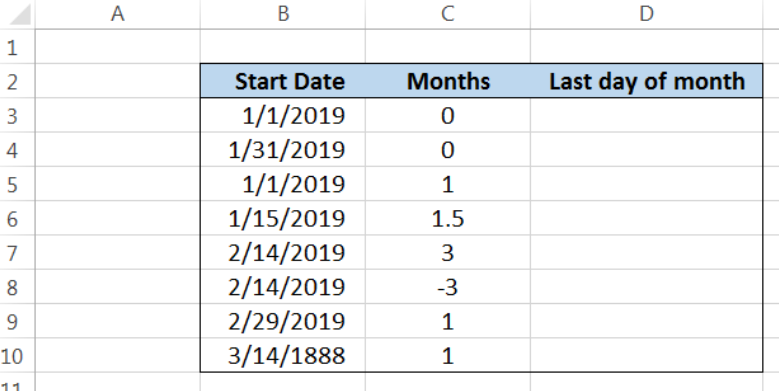 In row 5, the number of months is “1” and adding one month to January yields February. 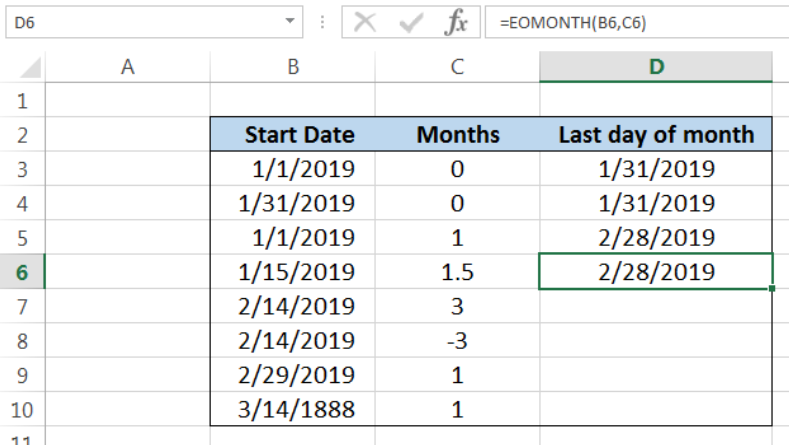 Hence, the last day of month resulting from the EOMONTH function is “2/28/2019”, which is the last day of February 2019. For our next example, the number of months is 1.5, which is not an integer. EOMONTH truncates this value and interprets the number of months as 1. 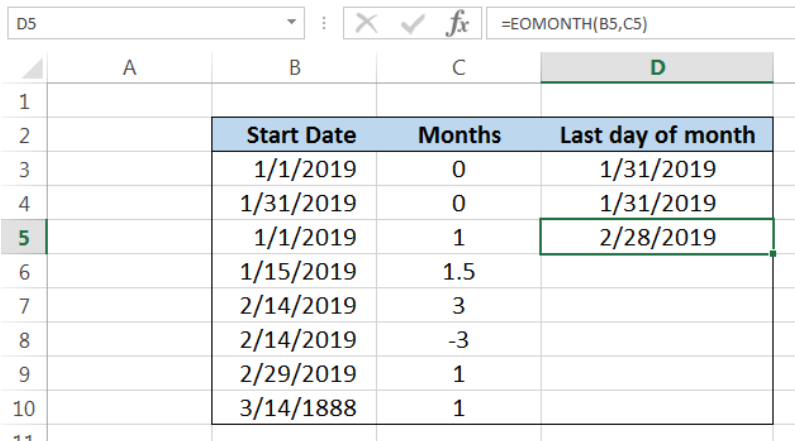 As a result, the date in cell D6 is “2/28/2019”, which is one month from our start date, and falling on the last day of the month of February. 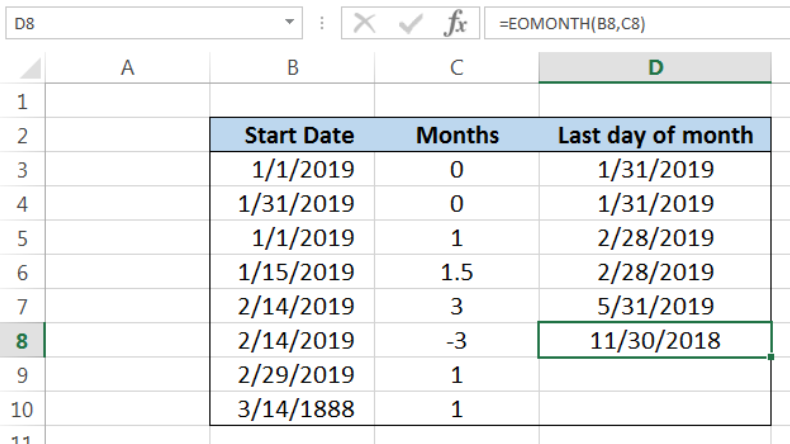 We can also determine the last day of month for past dates by using the EOMONTH function with negative values for the number of months, as shown in the next example. 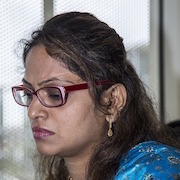 The value -3 means three months before the start date. Finally, our formula returns “11/30/2018” in cell D8, which falls on the last day of November in the previous year 2018. The EOMONTH function returns the error #VALUE! when the start date is invalid. In cell B9, the date “2/29/2019” is not valid because it does not exist. The last day of the month of February in 2019 is 28, not 29. 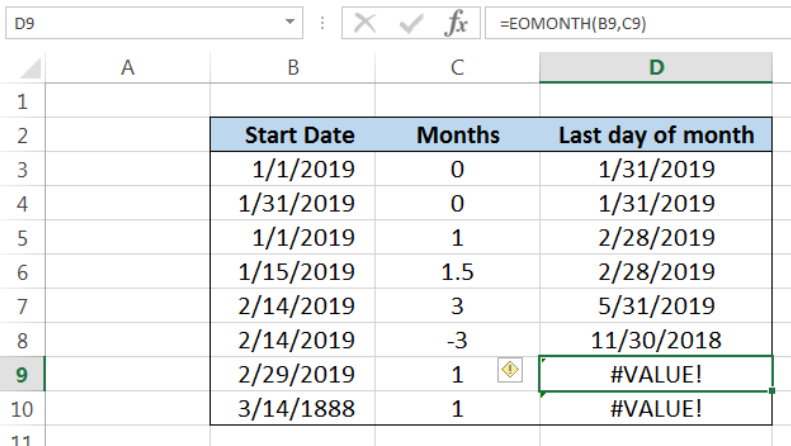 Cell B10 containing “3/14/1888” is also invalid because the EOMONTH function only allows dates between January 1, 1900 and December 31, 9999.